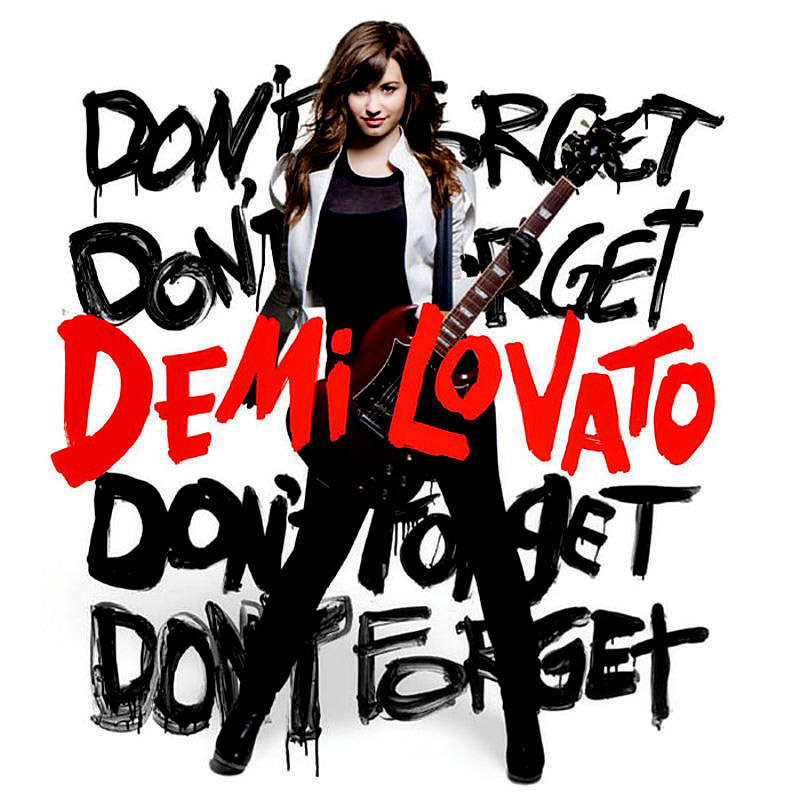 On September 23, 2008, the debut album of recording artist and Disney Channel star Demi Lovato, entitled Don’t Forget, was released through Hollywood Records. The songs on the album were mostly written by Lovato and the Jonas Brothers, and capitalized on the success of the Disney Channel Original Film Camp Rock. The album debuted and peaked at number 2 on the Billboard 200 charts, and was eventually certified Gold by the RIAA. Two singles were released to promote the album: “Get Back,” and “La La Land.” “Get Back” was released on August 12, and peaked at number 43 on the Billboard Hot 100; “La La Land” was released on April 10, 2009, and peaked at number 52 on the Billboard Hot 100. “La La Land” was also the first song of Lovato’s to be released internationally. Posted in Uncategorized and tagged 2000s, Album, Hollywood Records, Music, Women. Bookmark the permalink. 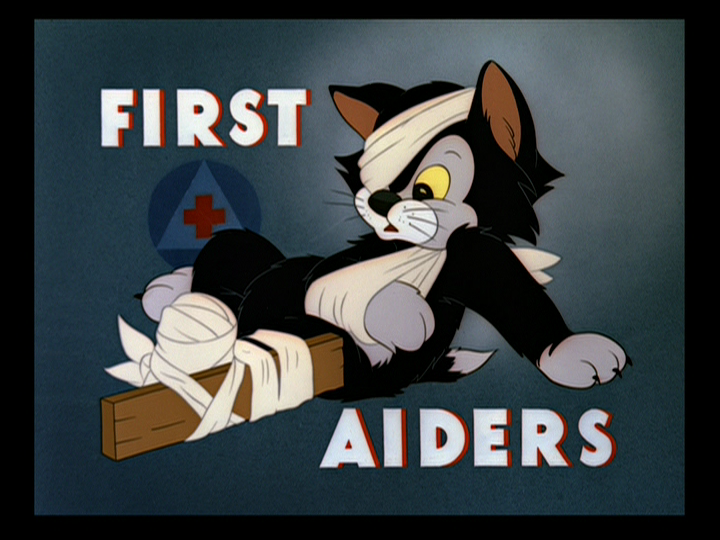 On September 22, 1944, the Pluto short film First Aiders was released to theaters. 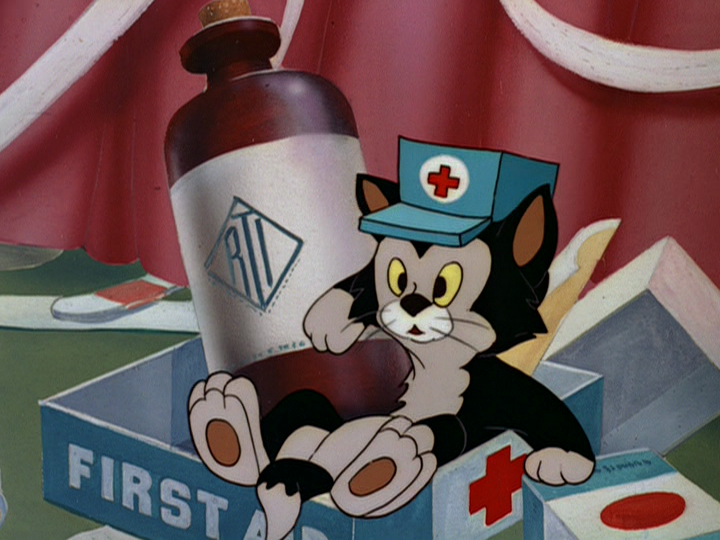 This short features an appearance of Figaro the cat from Pinocchio; thanks to his popularity, he would also have three shorts in a series of his own. The short was directed by Charles Nichols, with story by Harry Reeves and Rex Cox. Minnie is reading a first aid manual, trying to create a cravat bandage on her own eye. Pluto uses his own ears to bandage himself as he hears Minnie read out the directions. Minnie’s efforts on herself fail, however, and she asks Figaro and Pluto if one of them would like to help her. Pluto volunteers, as does Figaro, although Pluto is able to push the kitten away into a wash bucket. Minnie then blames Figaro for the mess, and starts to work with Pluto, asking him to hold a bandage. The bandage rolls from Pluto’s mouth, and Figaro chases after the strip, attempting to bring it back to Minnie. As Pluto and Figaro play tug-of-war, Figaro is sent flying across the room into the first aid kit. Minnie once again blames Figaro for the mess. Minnie then attempts to learn about artificial respiration with Pluto as her partner. Pluto lets out large amounts of air as she does so, and accidentally ends up with a cork from a nearby bottle of smelling salts in his mouth. He breathes in the smelling salts uncomfortably, but is unable to breathe out due to the cork. As Figaro laughs at Pluto’s predicament, the cork finally bursts out from Pluto’s mouth, hitting the kitten in the backside. As Minnie’s practice continues, she starts using splints and bandages. As she has him completely splinted, she has to go out and get more bandages. She asks the two to stay out of trouble, and Figaro angelically agrees until Minnie close the door. The kitten then begins to taunt Pluto, who is barely able to stand as he is in the splints. Figaro continues his torture, although he ends up getting beaten up slightly. As they escape outside, Pluto is able to break free of the splints, and the two chase each other around the house. Minnie returns from the store and, seeing Pluto is hurt, begins to use her first aid skills to tend to the dog. Figaro laughs from the stairs, but ends up falling into the splint, bandaged tight. The two end the short making nice, only because Minnie asked them. Posted in Uncategorized and tagged 1940s, Color, Figaro, Minnie Mouse, Pluto, Short film. Bookmark the permalink. 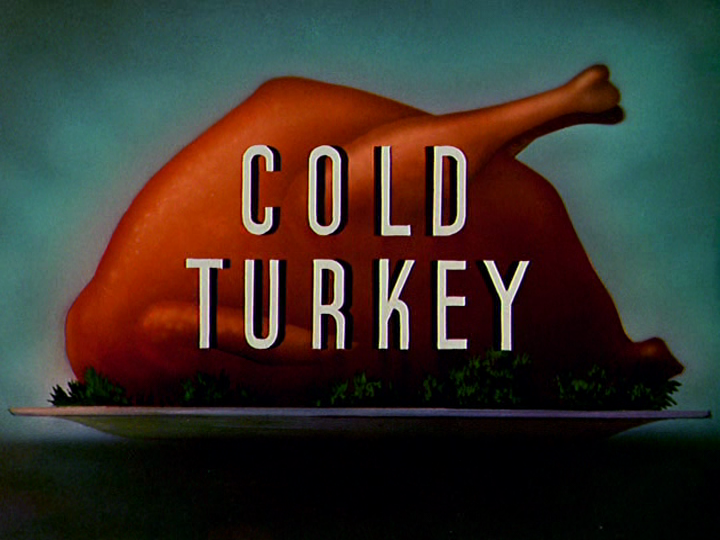 On September 21, 1951, the Pluto short film Cold Turkey was released to theaters. This is one of three shorts that also stars Milton, the cat nemesis of Pluto, with the others being Puss Cafe and Plutopia. this short also features the famous “Goofy Yell,” performed at a higher pitch by Milton. The short was directed by Charles Nichols, with story by Leo Salkin and Al Bertino. Pluto and Milton are sleeping as a boxing match is being played on the television, when they are woken up by a Lurkey’s Turkeys ad. Craving turkey, the two start searching for turkey, unaware that they will not find it in the television. After receiving a good shock, they realize that they should check the kitchen, as the ad suggests, and start searching every crevice. The two work together to launch Milton up to the cabinet, but the plan goes awry, with Milton being launched into the fridge instead. After he opens up the fridge door, the two find the turkey, but stop working together and end up frighting over it. 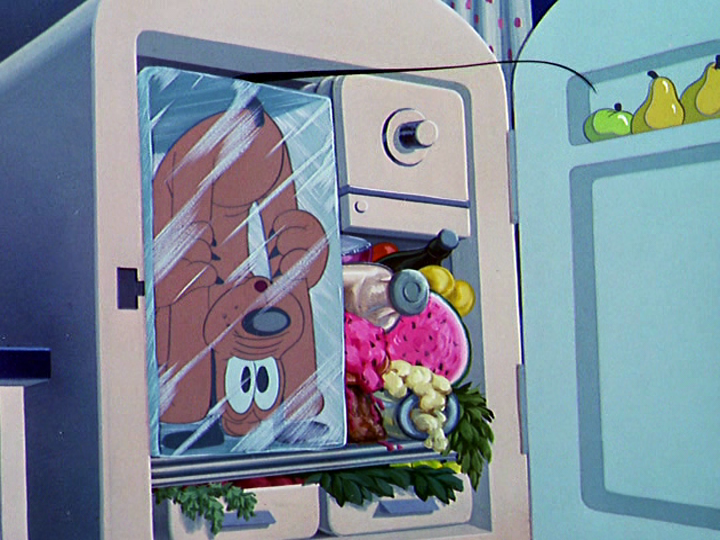 Pluto ends up closing Milton in the fridge, but the cat escapes with the turkey, closing Pluto in the fridge in retaliation. Pluto manages to escape the fridge and defrost, and finds Milton trying to cook the turkey over the heating vent. Pluto chases Milton into the television set, where he tries to fry the poor cat, and also starts cooking the turkey. As Milton flees to cool off, Pluto smells something burning, and the two quickly pull the turkey out, although neither can hold onto it for very long, as it has turned red from the heat. The turkey cools and immediately turns black before disintegrating, bones and all. The two stare at the turkey, and start accusing each other of destroying their food. They then mirror the boxing match announcements on television as they start to fight. 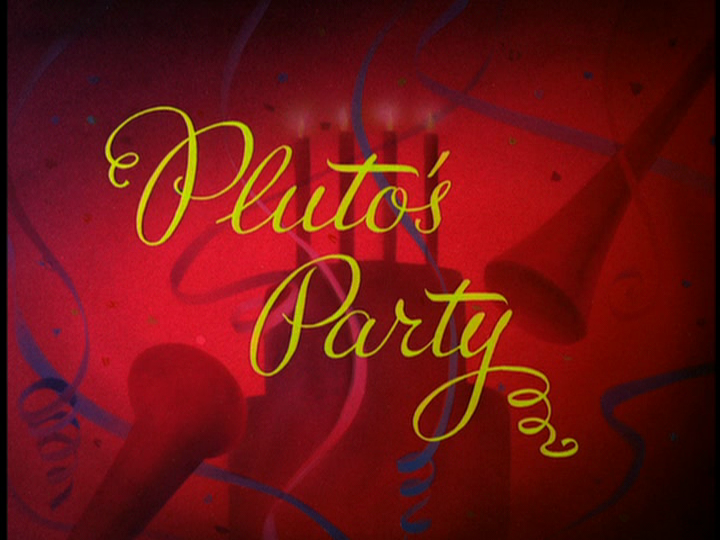 Posted in Uncategorized and tagged 1950s, Color, Pluto, Short film. Bookmark the permalink. 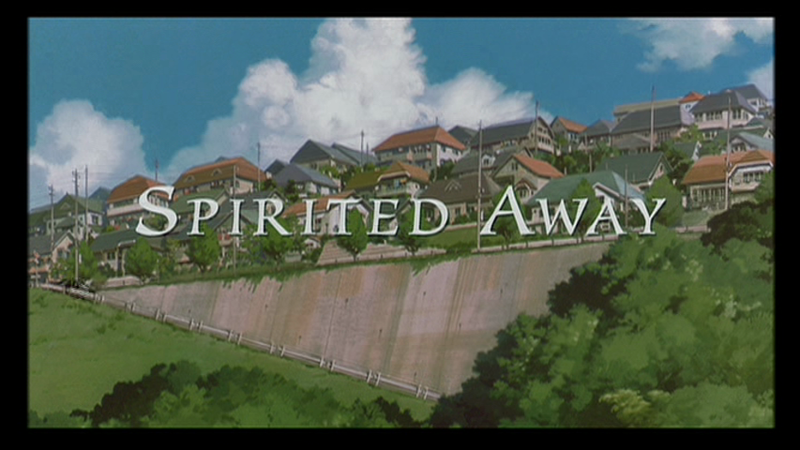 On September 20, 2002, the Studio Ghibli film Spirited Away (known in the original Japanese as 千と千尋の神隠し) was released in the United States in a limited amount of theaters, with a general release on September 27, 2002. The film was written by director Hayao Miyazaki, who was inspired by a friend’s ten-year-old daughter, wishing to write for her a character she could look up to. Disney asked Pixar’s John Lasseter, a fan of Miyazaki’s work, to oversee the English-language version of the film. The film became the most successful film in Japanese history, grossing over $229,000,000 in the Japanese box office. It would go on to win the Academy Award for Best Animated Feature at the 75th Academy Awards; its success helped solidify the popularity of Studio Ghibli films within the United States, with Disney internationally distributing most of the studio’s library. The film begins with ten-year-old Chihiro sulking in the backseat as she and her parents drive to their new home. Chihiro hates the move, and doesn’t hesitate to let her parents know. They end up lost on a back road, and Chihiro notices a rather strange stone outside. They come across a dilapidated old building, and although Chihiro doesn’t want to explore, her parents let their curiosity get the best of them. Not wanting to be left alone, she follows them. Her father thinks it’s only an abandoned theme park, but Chihiro still has a bad feeling about the place. Her parents then smell something delicious, and discover a delectable feast. Chihiro refuses to eat, but her parents dig right in. Feeling something isn’t right, Chihiro looks around the buildings, and notices black smoke from the chimney of what appears to be a bath house. She comes across a boy on the bridge, who warns her to escape before it gets dark. As she runs back to her parents, she is shocked to find that they have turned into pigs. Chihiro runs around the bathhouse, and finds she is trapped at the bathhouse, as the nearest town is now far away across a river. As she moans to herself that she must be dreaming, she finds herself disappearing. She then sees several spirits making their way to the bathhouse from a ferry-boat and, frightened, she runs away. She is soon found by the boy from the bridge, who has her eat something so she won’t disappear, assuring her that she will not turn into a pig. He then protects her from a strange bird flying overhead, and takes her through several back passageways until they reach the bridge. He warns her not to breath as they cross the bridge, otherwise the spell keeping her invisible will wear off. A frog leaps into the boy’s face, and Chihiro lets out a breath of surprise, revealing herself. The boy, named Haku, continues to protect her, but gives her directions to go to the boiler room to find Kamaji and ask him for work, so she can stay and save her parents. Once she has work, the witch that runs his world will not be able to harm her. Although frightened, Chihiro follows Haku’s instructions, ending up at Kamaji’s boiler room. When she asks him for a job, he first ignores her, then tells her that he doesn’t need any more help than the susuwatari that work for him. She assists one of the susuwatari by taking his piece of coal to the furnace, causing the rest of the susuwatari to pretend that they can’t carry their coal, wanting Chihiro to do their jobs. Kamaji then tells her that there is no work for her, just as a girl named Lin enters. As she panics upon seeing Chihiro, Kamaji tells her that Chihiro is his granddaughter. He convinces Lin to take Chihiro to Yubaba for a job, which Lin does begrudgingly. Lin then protects her from a suspicious attendant, leaving Chihiro to travel to Yubaba alone with a strange spirit. At first, Yubaba refuses to let Chihiro work at the bathhouse. She tries to find out who helped her, but Chihiro keeps demanding that she should be given a job. Yubaba then taunts her, but Chihiro tries to remain calm, even thought they are interrupted by a rather large baby. Yubaba then agrees to give Chihiro a job as she tried to calm the baby down, and gives Chihiro a contract to sign. Yubaba then takes Chihiro’s name, leaving her as just “Sen.” She calls for Haku, who is tasked to take care of her. As she tries to talk to him, he answers her coldly, telling her to call him “Master Haku.” Haku then calls out to Lin to take care of her, as no one wants to work with a human. In private, Lin reveals that she’s actually a kind person who is happy that Chihiro was able to make it past Yubaba. Lin warns Chihiro to stay away from Haku, as he is Yubaba’s henchman. The next morning, Haku sneaks into the room where Chihiro stays with the other women and tells her to meet him at the bridge, as he will show her where her mom and dad are. As she runs to the bridge, she comes across a strange spirit that seems to be watching her. Haku then meets her and takes her to the pig pen, and she starts to cry after seeing them. As she sits outside, he gives her her old clothes, with the farewell card her friend gave her. Haku tells her that Yubaba controls others by stealing their names, and she needs to remember her real name if she wishes to leave, but must keep it a secret. Haku no longer remembers his real name, but he strangely remembers hers. He kindly offers her food that will help her regain her strength, but she still starts to cry as she realizes what kind of situation she has found herself in. She heads back to her residence and hides her clothes, unaware that the strange spirit from before has followed her. Work begins for the night, and Chihiro works as hard as she can, although she is given rather challenging tasks. She meets the spirit that’s been following her and leaves the door open for it. Chihiro and Lin are sent to scrub the big tub, which hasn’t been cleaned in ages. Meanwhile, Yubaba senses a spirit coming that she can only call “scum.” As she tries to get a tab for her bath, the foreman refuses her, but the spirit she let in kindly gives it to her. He appears a few minutes later with more tabs, although she refuses them, making him sad. Yubaba is then alerted that a Stink God is at the gate and, while she can’t refuse the customer, she wants to rush it out as soon as possible. Chihiro is then given the job to attend to it, although she struggles due to its stench. The god enters the bath, but needs another tab to clean itself. As Yubaba watches, Chihiro successfully cleans the god, revealing it to be not a Stink God, but a River God. Chihiro then earns the respect of Yubaba and the staff, thanks to her actions. Late that night, the spirit, called No-Face, tempts a frog worker with gold before swallowing him. He then demands to be treated like a customer, using the frog’s voice to speak. He pays everyone with gold he created, and everyone rushes to keep him happy, so long as he gives them gold. Chihiro, however, is the only one not tempted by the gold, and stays in her room. She spies a dragon being attacked by several paper birds, and calls out to him, realizing that the dragon is Haku. The paper birds fly away when Haku crashes into her room, and while she wants to care for his injuries, he flies out to find Yubaba. 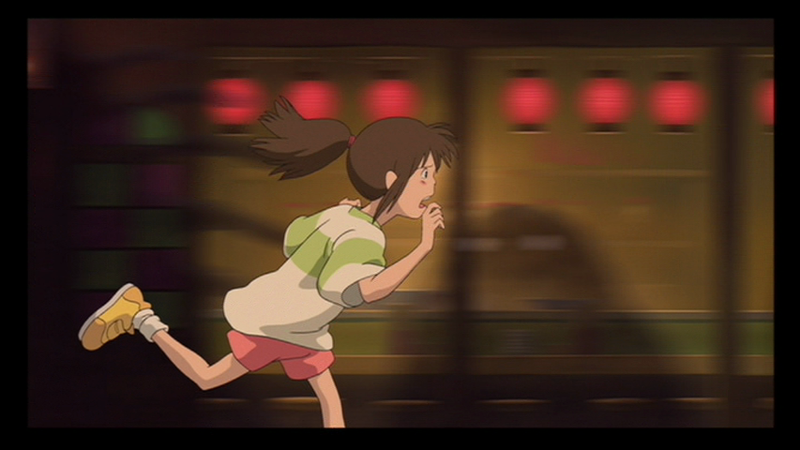 Chihiro then rushes off to stop him, but is interrupted by No-Face, who offers her a large amount of gold. She refuses him, and No-Face is saddened by this. Angered, he starts eating employees. Meanwhile, Chihiro continues her search for Haku, and breaks into Yubaba’s residence. She then comes across Yubaba’s rather large baby, who threatens to scream and break her arm if she doesn’t play with him. One of the paper birds, which had attached itself to Chihiro, starts talking, mocking the baby. It is then revealed to be Yubaba’s twin sister, Zeniba, who turns the baby into a mouse, and Yubaba’s bird into an insect. 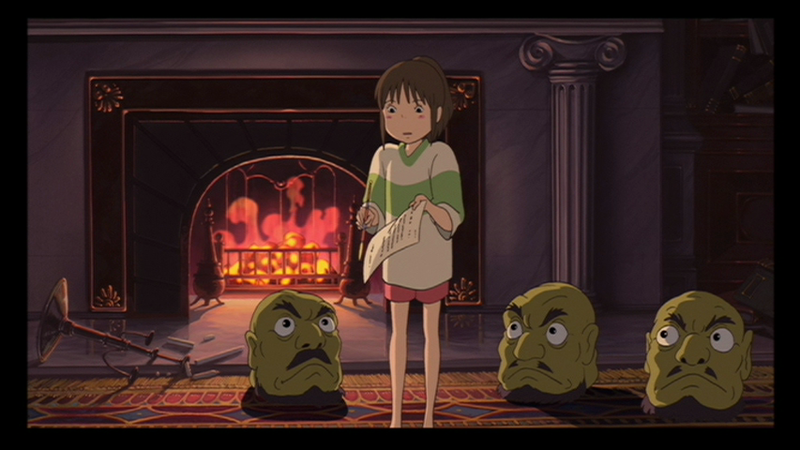 She then demands to take Haku to kill him for stealing a magic seal from her, but Chihiro refuses to move. Haku wakes, breaks the spell that Zeniba cast to appear, and falls down a trap door, taking Chihiro with him. He regains consciousness enough to escape, flying into the boiler room. Chihiro then uses an emetic dumpling she received from the River God to free the seal from inside Haku, which is slowly killing him. The seal is spat out, and Haku is returned to human form, although he is once again unconscious. Kamaji then looks after Haku as Chihiro goes to return the seal to Zeniba. 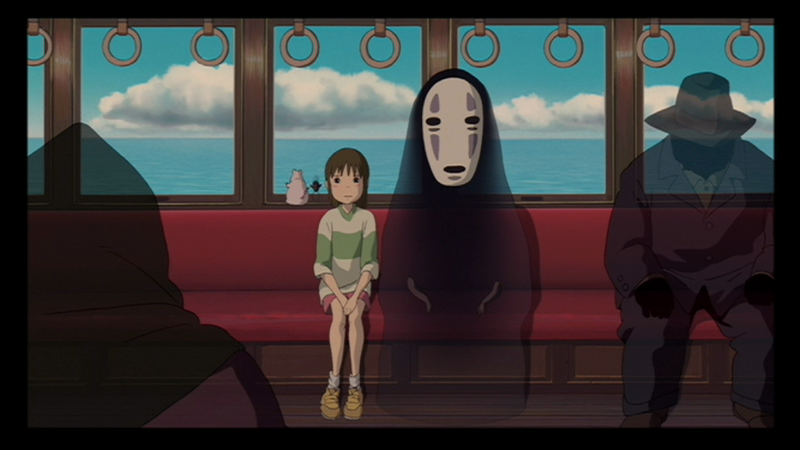 He gives Chihiro a train ticket to help her get to Zeniba’s, although she will have to walk back. As Chihiro looks for Yubaba, No-Face is tearing the place apart, wanting to see Chihiro. He tries to offer Chihiro anything she wants, but she refuses, telling him he should go back to where he came. He tells her that he is really lonely, and demands that she take the old. She gives him the other half of the emetic dumpling, and he releases everyone he ever swallowed. He follows her to the train, once again his silent, semi-transparent self. They all board the train and head to Zeniba’s. Haku wakes up later that evening, and asks Kamaji where Chihiro is, and what happened, as he doesn’t remember anything, other than Chihiro calling out for him in the darkness. He then goes to Yubaba, asking if she still hasn’t noticed that she’s lost something precious. She finally realizes that her baby is longer with her, and the gold is just sand. She panics, looking for her baby, and angrily demands that Haku tell her where he is. When she finds that he’s with Zeniba, she sits down in dismay. Haku agrees to get the baby back, but only if she allows Chihiro and her parents to be sent back to their world. Meanwhile, Chihiro and her friends arrive at Zeniba’s, and are greeted by a lamppost that will show them the way. Inside, Zeniba proves to be a kindly witch, but sadly tells Chihiro that she can’t help her, and she will have to do it on her own. When Chihiro tells Zeniba she must go back, she provides Chihiro with a magic hairtie that will protect her. Haku then appears at Zeniba’s, and Zeniba forgives Haku, making him promise to protect her. She then keeps No-Face as her helper as she flies away on Haku’s back. Suddenly, Chihiro has a flashback to when she was little and nearly drowned in a river. She was rescued by Haku, the spirit of the river, and reveals his true name to be Kohaku. He turns back into human form, and thanks her for saving him by giving him back his real name. They arrive back at the bathhouse, and Yubaba tricks Chihiro again, as Chihiro must guess which pigs are her parents in order to break the spell. Chihiro correctly answers that her parents aren’t there, and the contract is broken, freeing Chihiro and her family. 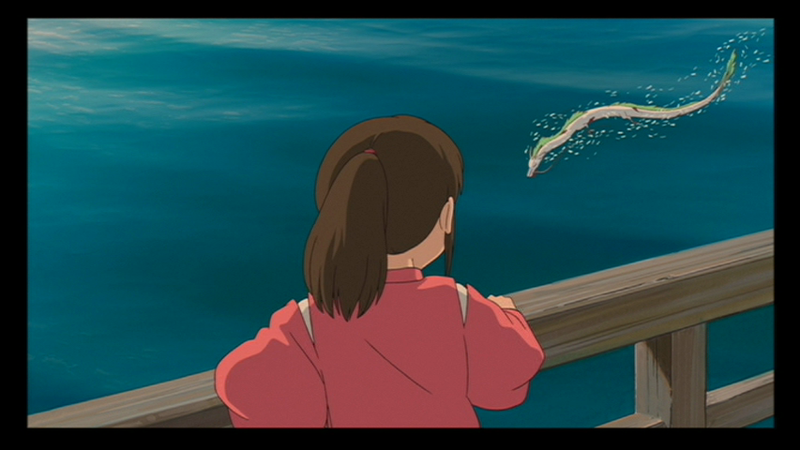 Haku takes her back to her parents, but he can’t take her further than the gate, but he promises they will meet again, although she must not look back when she goes through the tunnel back to her world. Her parents act like nothing has happened, and Chihiro quickly makes her way back, resisting the urge to look back. Chihiro joins her parents as they set off for the new house. Posted in Uncategorized and tagged 2000s, Academy Award Nominated, Academy Award winning, Animated Feature Film, Feature Film, International, Popularity, Studio Ghibli, Walt Disney Pictures. Bookmark the permalink. 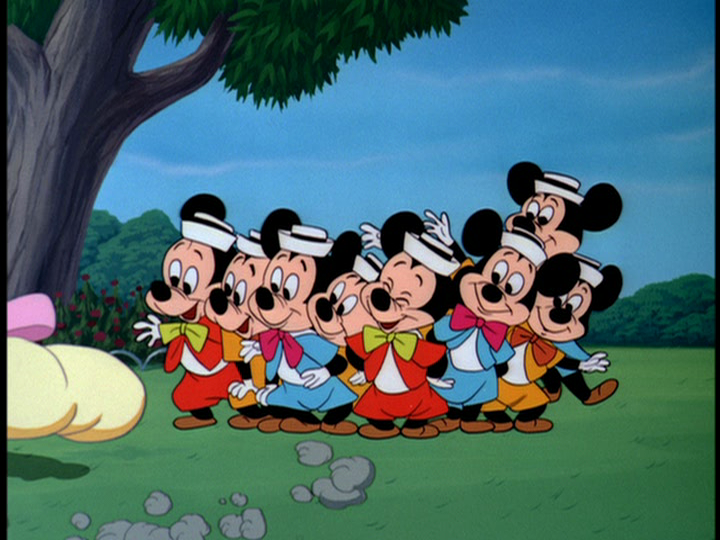 On September 19, 1952, the Mickey Mouse short film Pluto’s Party was released to theaters. This is the only short since the 1930s that features Mickey’s nephews. It was directed by Milt Schaffer, with story by Bill Berg and Leo Salkin. Mickey is coming out of his house with a giant cake, with Pluto trailing not too far behind. It’s revealed to be a birthday cake for Pluto, as it’s the dog’s birthday. As Pluto tries to sneak a bite of the cake, Mickey calls him out, reminding him that he has to take a bath first. Pluto sulks, and tries to sneak away, but is tricked by Mickey into lading into the washbucket. After his bath, he sits at the table again, wearing a fancy collar, and once again tries to steal some cake. Mickey once again calls him out, telling him to wait for his little guests. Pluto pouts, but soon hears the knocking at the garden gate, and rushes over happily. Mickey then has the boys engaged in a game of “Pin the Tail on Pluto.” When it’s Pluto’s turn, one of the boys grabs Pluto by the tail and spins him fast enough that Pluto can’t stand up, let alone walk straight. He ends up wrapped around a tree and, after peeking, thinks he can easily pin the tail on the picture; he doesn’t realize that his own body is perfectly blocking the picture. Pluto then accidentally stabs himself, and flies towards the picture in pain, perfectly placing the tail on the picture, winning the game. Soon after, Mickey calls everyone over for cake, and Pluto is told to make a wish. Pluto then wishes for all the nephews to disappear. After he blows out the candles, the cake suddenly disappears into the mouths of the nephews, leaving Pluto without a slice, and the nephews quickly leave, declaring the party to be over. Poor Pluto is dismayed to find he didn’t get any cake, until Mickey surprises him with the last piece. Pluto gratefully licks Mickey in-between bites of cake. Posted in Uncategorized and tagged 1950s, Color, Mickey Mouse, Pluto, Short film. Bookmark the permalink. 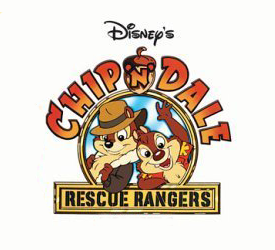 On September 18, 1989, the animated series Chip ‘n’ Dale: Rescue Rangers began to be aired in syndication. The series first premiered on March 4, 1989, and proved to be one of the more popular shows of the Disney Afternoon programming block. The series itself was originally created to be a companion show to the popular DuckTales series, with no mention of the famous chipmunk duo. The pair was added to bring back some established Disney characters, as was also seen in TaleSpin. The first episode to show in syndication was a television film called “To The Rescue,” which gave the story of how the Rescue Rangers became a team; it was later split into five parts when shown in the weekday run. The series ran as part of the Disney Afternoon until September 3, 1993. Posted in Uncategorized and tagged 1980s, Animated Series, Chip 'n' Dale, Syndication, Television. Bookmark the permalink. 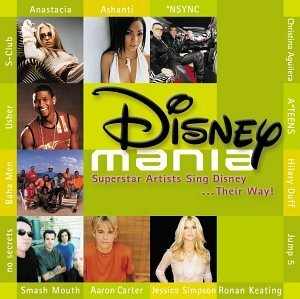 On September 17, 2002, the first album in the Disneymania series, Disneymania (also known as Disneymania 1) was released through Walt Disney Records. The idea of the album was to have popular modern musical artists perform various Disney standards, with some songs having music videos released on the Platinum Releases of Disney animated films. The album peaked at number 52 on the Billboard 200 chart, and achieved Gold certification status from the RIAA. Artists involved in this project included Usher, N’Sync, Hilary Duff, and Jessica Simpson. Four singles were released to promote the album: “Reflection” by Christina Aguilera, “Beauty and the Beast” by Jump5, “Colors of the Wind” by Ashanti and Lil’Sis Shi Shi, and “I Wanna Be Like You” by Smash Mouth. Posted in Uncategorized and tagged 2000s, Album, Compilation, Music, Soundtrack, Tribute Album, Walt Disney Records. Bookmark the permalink.